I need to initiate a silent (unattended) installation of Parallels Tools while setting up my virtual machine and I do not want it to reboot automatically after Parallels Tools installation. Is there a way to do it? In Parallels Desktop 8 and later you can install Parallels Tools via a command line interface without dialog boxes, progress bars and automatic reboot of your virtual machine after installation. 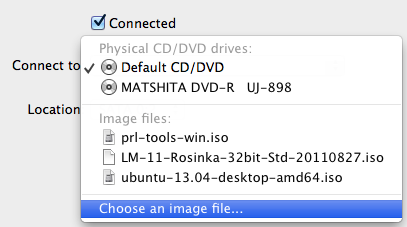 d. navigate to Applications -> Parallels Desktop -> Contents -> Resources ->Tools -> prl-tools-win.iso, then click on "Open" button. The image file is now connected to your virtual machine. c. right-click on cmd and choose "Run as administrator"
Installation will now start silently, no windows or dialog boxes will show up. After Parallels Tools are installed you will also not see any notification about that, and your virtual machine will not reboot automatically. 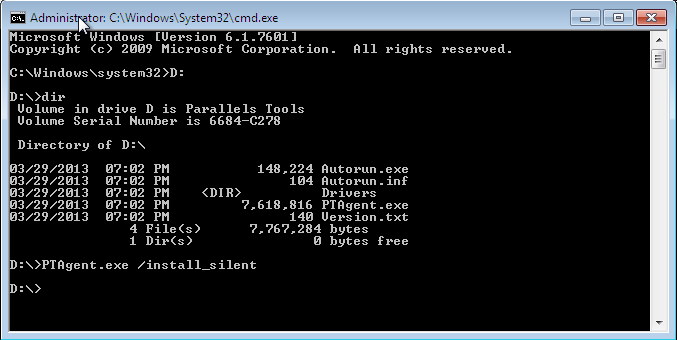 NOTE: It is still necessary to reboot your virtual machine manually to make all Parallels Tools features work properly.